PT Barata Indonesia (Persero) - Barata or later known as Barata Indonesia is a well-established state-owned company in Indonesia, based in Gresk East Java and running business in the field of Engineering Procurement and Construction services (EPC). 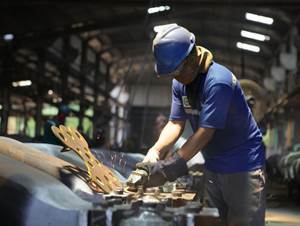 Barata Indonesia's business include foundry, manufacturing equipment / industrial components, EPC Projects. Barata Indonesia was established in 1971 as a meger results of 3 state-owned companies; PN Barata, PN Sabang Merauke and PN Peprida. As today, Barata Indonesia has 1 Jakarta representative office, and 3 branch offices, located at Tegal Central Java, Cilegon Banten, and Medan South Sumatera. Barata's head office is registered at Jl Veteran No 241 Gresik 61123. PT Barata Indonesia (Persero) is a State-Owned Enterprise (SOE) in the form of Limited Liability Company of which 100% of its shares is owned by the Government of the Republic of Indonesia which represented by the Minister of State-Owned Enterprises (SOE). In term of financial performance, Barata Indonesia was able to achieve a better performance in the business year of 2017 as compared to 2016. According to information found in PT Barata Indonesia (Persero) Annual Report 2017 as cited by JobsCDC.com, Barata Indonesia managed to record total sales of Rp 1,19 trillion in 2017. This reflected an 69.7% increase from Rp 720.27 billion in 2016. Barata Indonesia booked Rp 51.6 billion in total net profit in 2017, which increased 154% from Rp 20.01 billion in 2016. JobsCDC.com now available on android device. Download now on Google Play here. Please be aware of recruitment fraud. The entire stage of this selection process is free of charge. PT Barata Indonesia (Persero) - D3, S1 Secretary, Instrument Engineer Barata April 2019 will never ask for fees or upfront payments for any purposes during the recruitment process such as transportation and accommodation.